If you know me at all, you know I’d rather do anything than work out. It’s tied with cleaning the house. Actually Jenni and I are both averse to expending more energy than it takes to chase our kids around. We’ve been saying, who has the time to work out? Fortunately for us, my good friend, Kelly Simmons, is a Pilates instructor and health coach (and I don’t even hate her… I adore her actually). Kelly has come up with a 10-30 minute workout, easily accomplished at your kids’ nap time- like in your bedroom, bra optional! That’s the most I can deal with right now, ya know? The beauty of this workout is that you can do it anywhere at any time! No getting sweaty, no gym equipment, nothing. This whole workout was done in the corner of my bedroom- see, you can do this anywhere! I even do some of these exercises in the play room with my kids! If you’re in the Nashville area, be sure to scroll down to the bottom of the post for all of her contact info and social media! She’s THE BEST. Check out Kelly’s gorgeous site HERE. 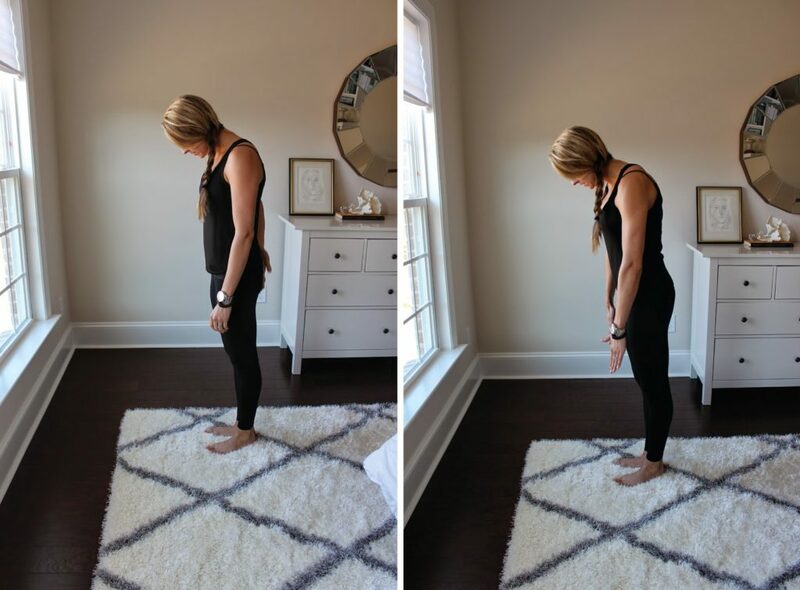 These exercises are perfect for an at-home workout, and can be completed quickly—in less than 10 minutes, or could be expanded for a full 30-minute workout. Full body move that’s great as the first and/or last exercise in your workout. Start in a standing position, arms hanging by your side. Nod chin to chest, round the upper body over the waist, pulling the ribs up to the ceiling. Come back to a tall back by re-stacking the spine. The neck and head are the last to come up. Repeat. On the last repetition, roll all the way down, place your hands on the floor (bend your knees if needed) and walk out to a plank position. Hold the plank position for a few deep breaths, then go into a downward dog stretch and then back to the plank. Reps/sets: 2-3 roll downs, 3-5 walk out planks/downward dog stretches. This move targets the abdominals, but your arms and legs will also get involved. Lie on your back, arms by your side, fingers reaching towards your toes. Bring your right knee to a “table-top” position (knee in line with the hip, shin parallel to the mat). Keep the 90 degree bend behind your knee and lower your toe toward the mat. Lower as far as you can while keeping your ribs pressed into the mat. Switch legs. Then, bring knees together and lower both legs together. More difficult: Add the arms– with straight arms, reach behind you as lower your toes. Reps/sets: 5-10 reps on each side, 5-10 reps with both legs. This is a great stretch that prepares your powerhouse for the next move. Come into an all-fours position (hands under shoulders and knees under hips). Lift ribcage high to the ceiling, tucking the tailbone under. Then, reverse– drop ribs down, press tailbone into the air. This is a balance challenge and also works back, abs, glutes, hammies. Stay on all fours, weight balanced evenly across shoulders and hips, with the waistline cinched up. Stay in steady, balanced “table” position, and reach one leg out behind you, hip height. Take a couple deeps breaths. Switch legs. Repeat. Do arms (one arm out at a time, repeat). Then, lift one arm and the opposite leg. See-saw the arm and leg, keeping the powerhouse strong. More difficult: bring opposite elbow to opposite knee. Reps/sets: 2-3 reps of lifting each leg and arm, 5-10 see-saws. Strengthen your abdominals and back with this rotation exercise that will also make you feel taller. Sit on your sits bones, arms in a “T”, legs mat-with apart, knees lightly bent and feet flexed. Sit tall, twist from the ribs, reach over the thigh to “saw” off the pinky toe with the pinky finger. Come up to vertical in the twist, then unwind through center. Repeat on opposite side. 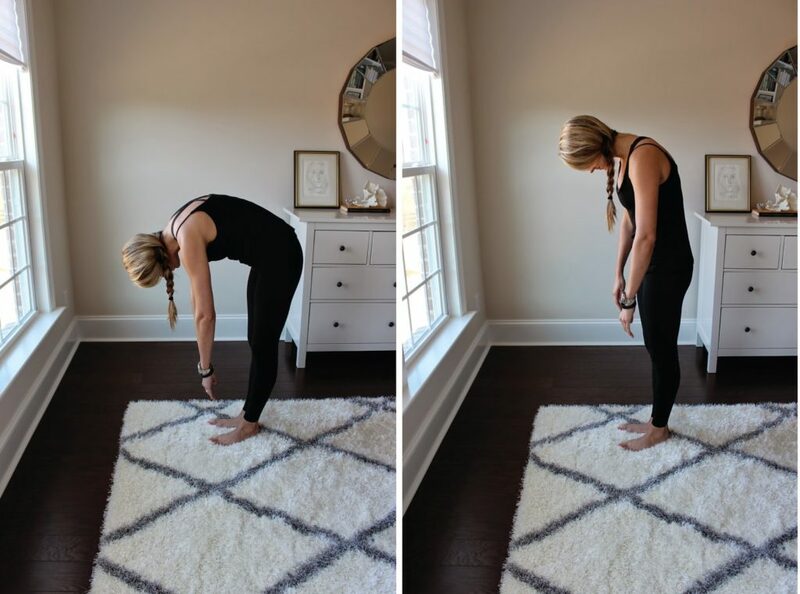 You may not feel as graceful as a swan as you do it, but this exercise is excellent for improving posture. Lie on your stomach, legs together, all ten-toe nails on the mat. Make a pillow with your hands—palms down, one hand over the other. Put your forehead on your hands. Lift your abdominals off the mat. Hover your head and shoulders a few inches off the mat and hold for a breath. Get your glutes, hammies, core and arms with this combo move. Lie on your back, knees bent hip distance apart, feet flat on mat. Curl tailbone up, follow by lifting the pelvis, middle back and upper back into a “bridge”— long line from shoulders to knees. Lower down by rolling through the upper back, middle back, low back until the tailbone touches the mat. Repeat. On last rep, stay in the shoulder bridge, bring your right knee into your chest then straighten the right leg up to the ceiling. Flex the heel, lower the leg to the height of the left knee, point the toe, and lift. Repeat 5 times. Bend the knee, lower the foot to the ground. Switch sides. Reps/sets: 3-5 shoulder bridges, 5 reps of leg lifts on each side. Stand with heels together, toes apart, zipping legs together. 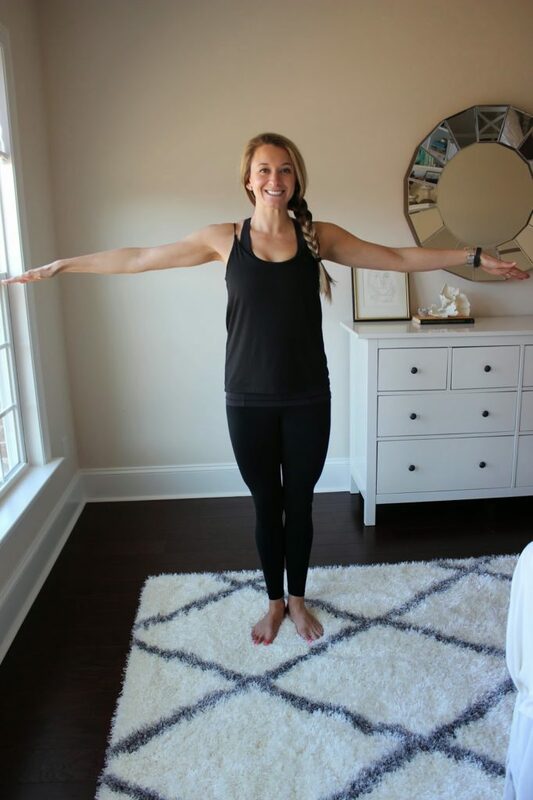 Arms out into a wide “T.” Imagine a corset around your ribcage to keep your abdominals working. Lift onto the toes, look to the right, look to the left, look to center. Lower the heels. Repeat. More difficult: close your eyes as you turn your head to each side. 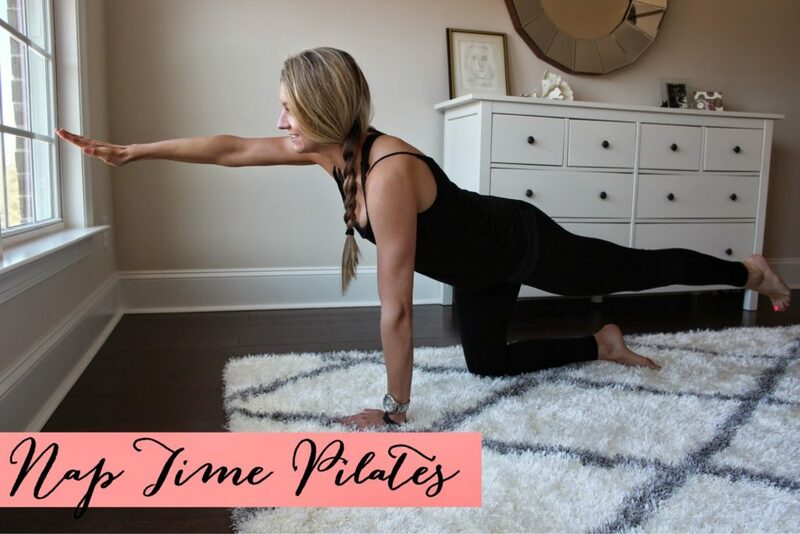 Kelly Simmons, PMA®-CPT is a Nashville-based, NYC-trained Pilates instructor who helps clients improve overall strength, flexibility and mobility. Through group fitness and private training, she focuses on safe, effective movement for full-body workouts that emphasize the core. As a certified Health Coach with the American Council on Exercise, she helps people get well and stay well with tools and strategies for everyday healthy living. For fitness tips and healthful ideas, go to Facebook.com/KellySimmonsHealth, find her on instagram @kellysimmonshealth, and follow her on Twitter at @ksimmonshealth. Many other tips for for students are available on the websites some are as follows ease the transition from studies to employment, he should acquire work experience from a well reputed organization and good understanding with problems and diversities and ukbesteessays uk writers is there to help.